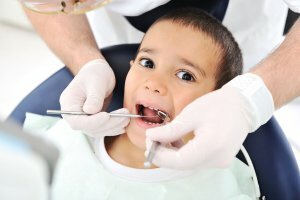 What Happens at Your Child's First Dental Visit? Before Dr. Spalitto starts the exam, he will sit down to talk to you about your child’s medical history. The more information you can give about your child’s health, the more effective the visit will be. You should also list any medications that your child takes so Dr. Spalitto knows how to proceed with the exam. The purpose of this dental visit is for Dr. Spalitto to thoroughly examine your child’s mouth to determine the current condition of his or her teeth and gums. This exam gives the dentist information about future growth and development. It also allows Dr. Spalitto to check out the child’s oral hygiene to determine if there is a risk of tooth decay or if there is already evidence of cavities. This first visit also gives Dr. Spalitto the opportunity to clean your child’s teeth and gums to remove any plaque or tartar that you might have missed with at-home brushing or flossing. During the cleaning, Dr. Spalitto can also give you some tips about the proper way to care for your child’s teeth and gums at home. Take advantage of this first dental visit by asking Dr. Spalitto any question you have about your child’s developing mouth. You and the dentist can discuss habits like using a pacifier or sucking the thumb. With your discussion about dental treatments, you can figure out exactly what you need to do to help your child grow up with a healthy, beautiful smile.